Among the vast of benefits of the consolidation of distribution facilities is the new marriage of the technical staff to the hubbing equipment. Sam Birel and his team have already implemented some new equipment which makes loading the hubs into the machine easier, faster and safer. The next improvement to the equipment has been presented to the owners, the expense approved, and will be implemented this Fall. The entire mechanism that attaches the hubs to the wheels in the assembly line is being replaced by new technology that Mr. Birel happened to come across on one of his trips. The new heads use a different process, which eliminates flashing that can be seen on many hubs that are presently in circulation. The occasional flashing does not pose a safety issue. Torque tests are accomplished on all hubbed wheels to ensure attachment integrity, and the current hubs are perfectly safe and reliable. The new equipment puts out a roll-over that is absolutely perfect in form, with no downside. 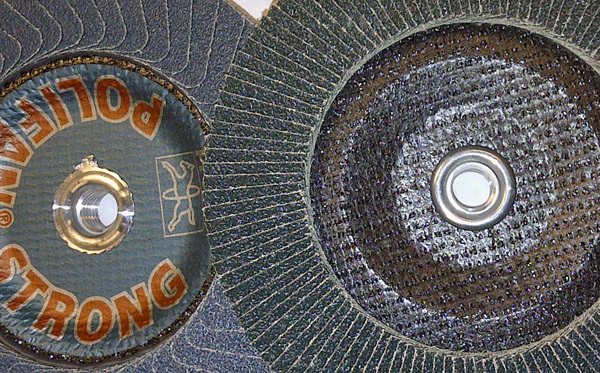 You will start to see the new roll-overs on all grinding wheels, cut-off wheels and POLIFAN® Flap Discs in November. They will be widespread circulated by January.